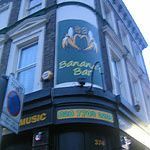 Bananas Bar is located on Walworth Road and offers a variety of drinks alongside Continental cuisine. Do you work at Bananas Bar? What did you think of Bananas Bar? This isn't a bar, it is a discriminatory hole where if you are not Portuguese or Brazilian you are not welcome. The barmaid was as rude, unfriendly and ignorant as you'll find. Keep away, you'll have a better time in the vicar's hay! Went to the Bananas Bar last night & honestly was the best night out I have had in ages! The drinks were very fairly priced service was top class and staff were pleasant & helpful! Reccomend to all hands down the best club on Wooly Road! One night out there and you will be back there next week! The Dj was amazing playing as what could be described as Portuges/Spanish Bashmemt & Dance music! The club room has a unique feel with flashing lights big projector & a wicked smoke machine! Some things are to good to be true but All roads lead to Bananas Bar on Wooly road! The group of people I went with all want to go back there next weekend we even booked a table! Good afternoon! I loved this restaurant, the tapas are very good, cool environment. and one of my favorite restaurants in Camberwell. Half way between Elephant and Castle and Camberwell on the busy Walworth Road, the Bananas Bar is a Portuguese bar which caters for the considerable Latin crowd in the area. Architecturally speaking it’s basically a traditional British pub which has been given a bit of Latin-style redecoration. One end of the pub is dominated by a massive TV screen, which looks down on the small dance floor (pole included), but elsewhere there are tables to sit or eat at. Walworth Road is a very mixed area and the bar is clearly friendly and inviting to all manner of locals, but essentially its main clientele is either Spanish/Portuguese or South American. In the day you’ll find families sitting down to lunch - in the evening the place starts to resemble a nightclub, and there are more couples and singletons on the prowl for a partner. The entertainment includes everything from live music and DJs playing Latin-themed music to a Brazilian barbecue on a Sunday afternoon. Starters vary from garlic prawns (£5.90) to fried cassava (£3.50) and various combinations of vegetables (£3), while the main menu offers grilled chicken fillet, pork steak or beef with refried beans, all at £6. There are no vegetarian options but the chef will happily rustle up omelette and chips for the meat-phobic for the same price. The portions are reasonable if not huge (especially when you consider the relatively modest price tag) and fairly tasty if not quite gourmet fare. But you shouldn’t leave without trying the delicious torta prestigio coconut cake (£3). As you‘d expect, Portuguese wines dominate the wine list, with Casal Garcia Verde (£17.95) and Monte Velho (£18.95) featuring among the whites and reds. Beers on tap include Sagres, Kronenbourg (both £4 per pint), Beck’s (£3.60), Fosters (£3.50), John Smith’s (£3.50) and Guinness (£3.70), with bottles of Sagres, Beck’s, Budweiser and Sol all available at £3. There’s also a massive list of more than 40 spirits, plus alcopops, and champagnes from Moet & Chandon (£48.50), Dom Perignon (£150) and even Cristal at £250 a bottle. There‘s certainly little reflection of the culturally mixed atmosphere of Walworth Road, but there’s no doubt Bananas Bar fills a demand from a very specific market quite capably.